WASHINGTON/SYDNEY (Reuters) – The long-awaited text of a landmark U.S.-backed Pacific trade deal was released October 5, revealing the details of a pact aimed at freeing up commerce in 40 percent of the world’s economy but criticized for its opacity. If ratified, the Trans-Pacific Partnership will be a legacy-defining achievement for U.S. President Barack Obama and his administration’s pivot to Asia, aimed at countering China’s rising economic and political influence. The agreement would set common standards on issues ranging from workers’ rights to intellectual property protection in 12 Pacific nations. China has responded with its own proposed 16-nation free-trade area, including India, that would be the world’s biggest such bloc, encompassing 3.4 billion people. The White House is likely to formally notify U.S. lawmakers on Thursday that the president intends to sign the deal, a senior Obama administration official said. That would start the 90-day clock before his signature triggers the next step in a process of seeking final congressional approval. The earliest the TPP could come before Congress is March, just as the U.S. presidential primary season is heating up, creating the risk that the deal becomes a campaign issue. The TPP is opposed by labor unions and many of Obama’s fellow Democrats who are worried about the impact on jobs, including presidential candidate Hillary Clinton, who backed the developing trade pact when she was secretary of state during Obama’s first term. House of Representatives Speaker Paul Ryan, a Republican, said he was reserving judgment for now, and the U.S. Chamber of Commerce, whose support will be key for passage through Congress, said it looked forward to examining the details. U.S. Trade Representative Michael Froman warned that trying to reopen the complex deal could unravel the whole package. Other firsts cited by the partners – Australia, Brunei, Canada, Chile, Japan, Malaysia, Mexico, New Zealand, Peru, Singapore, the United States and Vietnam – include a prohibition on subsidies to harmful fisheries as well as commitments to discourage imports of goods produced by forced labor and to adopt laws on acceptable working conditions. Malaysia will have to implement reforms to combat human trafficking, and Vietnam will have to allow independent labor unions before they can reap benefits of the pact. But the deal does not include measures demanded by some U.S. lawmakers to punish currency manipulation with trade sanctions, disappointing carmaker Ford Motor Co, although members pledged not to deliberately weaken their currencies. That could put pressure on several of Asia’s major developing economies, including the Philippines and Indonesia, which have recently expressed interest in signing up to the pact.. Thailand said it was studying the deal and might consider joining. WASHINGTON (Reuters) – Malaysia will have to fully implement measures to combat human trafficking and Vietnam must allow independent labour unions before reaping the benefits of a new Pacific trade deal, details of the pact released on Thursday showed. The Trans-Pacific Partnership (TPP) will require countries to legislate for minimum wages and hours of work, discourage trade in goods made by forced labour and maintain labour protections in designated export zones as a condition of membership. Bilateral agreements with the United States lay out specific conditions for each country, including affected domestic laws and a mechanism to police implementation for seven to 10 years. “Being tied to entry into force means we have the ability to certify whether or not a country has met those standards so it gives us significant leverage,” U.S. Trade Representative Michael Froman said. The country’s record came into focus earlier this year after Washington upgraded Malaysia in its annual trafficking scorecard, sidestepping a law which would have barred the TPP from a fast track through Congress. Lawmakers demanded an investigation after a Reuters examination found the U.S. State Department office set up to independently rate countries’ efforts was repeatedly overruled by senior U.S. diplomats. Vietnam, which has been targeted by critics concerned that low wages and weak worker protections will entice U.S. manufacturers, will have to allow workers to form their own autonomous unions. Other reforms will increase penalties against forced labour and protect against discrimination. The labour chapter requires all TPP countries to grant workers the right to form unions and bargain collectively and ban forced and child labour and discrimination in employment, as well as new commitments to legislate working conditions. Breaches can be punished by trade sanctions. But the deal stops short of setting a floor for minimum wages or ceilings on working hours. The U.S. federal minimum wage is $7.25 per hour. Minimum wages in Vietnam in 2014 ranged from $85 to $121 per month. Auto rules contentious in U.S.
WASHINGTON (Reuters) – U.S. Trade Representative Michael Froman defended rules governing trade in autos as part of a Pacific trade pact and warned that trying to renegotiate parts of the deal could unravel the whole thing. 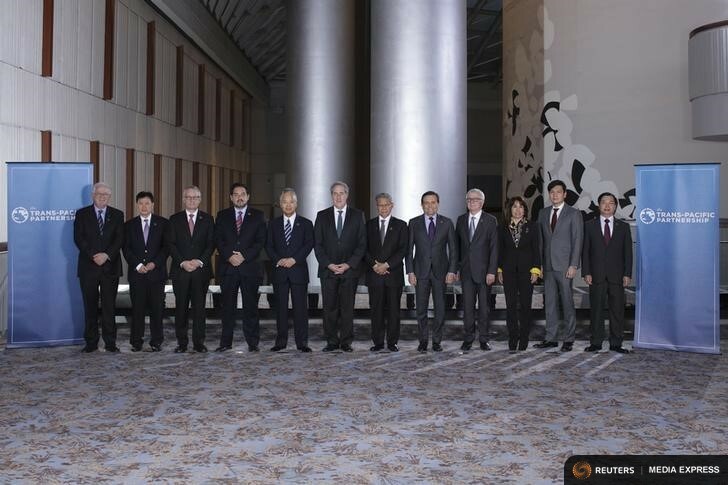 The Trans-Pacific Partnership (TPP) will cut trade barriers for a dozen nations but has angered U.S. car makers and some lawmakers by stopping short of sanctions against countries that deliberately weaken their currencies. “When you combine that with the potential opening of the Japanese market, the elimination of the 70 percent tariffs on autos into Vietnam, the elimination of the 30 percent tariffs into Malaysia, plus the elimination of non-tariff measures that are quite extensive in Malaysia, the increased opportunity to actually export autos … we think this is a strong outcome,” he said in comments approved for release on Thursday. The deal stipulates that only 45 percent of a vehicle will have to be sourced from within the TPP, down from a comparable 50-percent-plus level under the two-decade old North American Free Trade Agreement rules, which are credited with driving an auto industry boom in Mexico. The deal also sets a local sourcing threshold of 35 to 45 percent for individually-traded auto parts. The TPP rules mean that more than half of a vehicle could be sourced from outside the 12 countries participating in the trade pact and still be sold in the United States – the bloc’s largest market – without tariffs. They will give Japan’s auto industry, led by Toyota Motor, a freer hand to source parts from Asia, including from plants in locations outside the TPP zone, such as China. But U.S. officials have stressed the local content rules are irrelevant until tariffs are removed. The agreement gives U.S. automakers, led by General Motors and Ford, 25 years’ protection against auto imports and 30 years for trucks. Some parts seen as sensitive for U.S. manufacturers, including turbo chargers, steering systems, lithium batteries and some ball bearings, will retain tariffs for 10 to 15 years. Froman ruled out trying to reopen parts of the TPP, a move pushed by senior House of Representatives Democrat Sander Levin, who comes from the auto-making state of Michigan. The complex pact was not like a bilateral trade deal, Froman said.